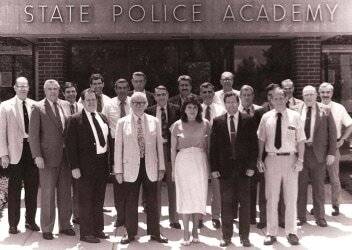 First meeting of the newly chartered New England Division of the IAI, 1987.
a. To associate persons who are actively engaged in the business of identification, investigation and scientific crime detection in an organized body so that the profession in all its branches may be standardized and practiced effectively and scientifically. b. To encourage research work in scientific crime detection and developments. c. To encourage the enlargement and improvement of the science of fingerprints and other branches of scientific identification in crime detection. d. To keep its members apprised of the latest techniques, discoveries and developments in crime detection and the science of identification in all its phases.